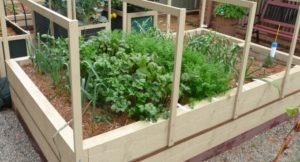 Last August, I wrote an article for SGA about my first attempt at a Sustainable Wicking Worm Bed. For details see (https://www.sgaonline.org.au/sustainable-wicking-worm-bed/). The bed above is a larger version developed to suit the needs of my small suburban back yard. I have kept the size down because I will need 4 of these to replace my conventional 4 bed crop rotation system, and I have limited space. 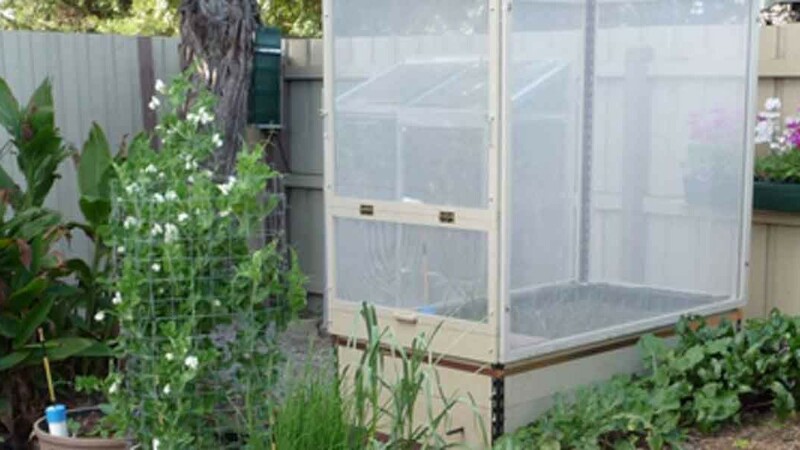 The length of wicking beds is restricted only by the available length of plastic liner, but usually their width is limited by the distance you can reach without climbing all over it. This bed is 2700mm long x 1650mm wide x 600mm deep. I have smaller specialised beds for growing dwarf fruit trees (Meyer lemon and Hamlin orange), Tomatoes and Strawberries (runners just planted). The Tomato bed is growing Broccoli until it gets warm enough for Tomatoes. I have used the past 12 months gathering knowledge and applying it to the first wicking worm bed I made. I learned that the bed worked extremely well using very little water and maintaining a moist soil ideally suited to growing vegetables. 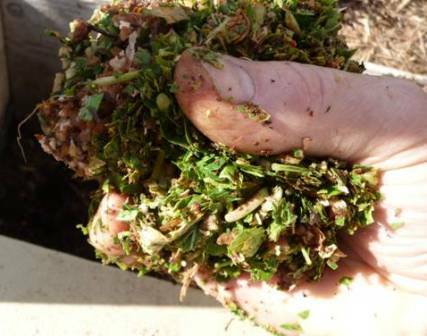 The worm farm prospered in the moist conditions consuming about 1 litre of finely chopped kitchen/garden waste per week. The bed above is using twice that quantity. Two different types of worm inhabit my wicking worm beds. 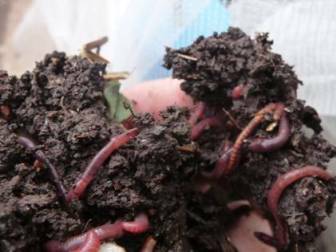 These are composting worms and burrowing earthworms. Garden worms burrow deep into the soil creating nutrient rich pathways for plant roots to colonise as well as fertilising the soil. They distribute nutrients and micro-organisms from the worm farm through the plant growing area. Their tunnels provide efficient distribution of water and air to the plants roots. When establishing a new wicking worm bed, I harvest garden worms from soil in my conventional organic garden beds, and supplement these by buying Amynthus Gracious/Cortius worm eggs. Despite the high levels of microbial activity in the bed and the continuous supply of nutrients from the worm farm, I top up the soil after harvesting a crop with rich material from my compost heap. The bed has an isolated ecosystem, and I need to maintain this supply of diverse micro-fauna originating in the larger garden ecosystem. I also inoculate some of my plants with Mycorrhizal Fungi (available on the internet) by dusting the seeds before sowing them, or the root ball when planting seedlings. This fungi develops a symbiotic relationship with plants by penetrating their roots to set up nutrient exchange sites. They then send their long fine root like Hyphae in search of nutrients and water. The Hyphae exude enzymes dissolving rock and lignin in the soil, releasing nutrients and building soil structure. In return for the fungi’s supplies of nutrients and water, the plant manufactures vitamins and carbohydrates for the fungi’s use. Unfortunately Brassicas and beets do not form symbiotic relationships with Mycorrhizae. I don’t dig the soil in my wicking worm beds; it breaks up the structure and disturbs the worms too much. The soil doesn’t get compacted because it is continuously aerated by the worms and micro-organisms in the soil. I use very little fertiliser to supplement the finely chopped kitchen/garden waste I supply to the worms. However, before planting crops, I add a little blood and bone and rock dust to the beds surface. If the growth of flowering and fruiting plants is too lush and sappy, I supply extra potassium by adding seaweed extract to the bed’s water tank. A little lime is added as a surface dressing for plants requiring a neutral or alkaline soil. I test for pH to get this right. I have a non commercial web site which provides detailed information on how I built my (so far) 5 above ground wicking worm beds, 1 triple in-ground wicking worm bed and 8 wicking bins for anyone who would like to try. The address is www.jas49580.blogspot.com .